The other night I was thinking about the homesteading skills I learned from my grandmothers. They were very different women, each with their own skill set. Neither of these women were homesteaders really but they had vintage skills to share with me…sadly, at the time, I wasn’t very interested in learning them. But it got me thinking about homesteading skills; how important it is that we learn them and begin to teach them to others (especially the younger generation). These vintage skills were naturally passed on for generations. That is until many of us moved into cities and found that we enjoyed convenience over quality. However in the last few years I have seen a revival of homesteading – from small backyard homesteaders to those leaving city life behind and moving onto acres in the country. But what homesteading skills do we really need? Where can we learn them and who needs to be taught? Well I’m glad you asked! I formulated a little list of what I think are the most important homesteading skills that we need to learn. Now I’m not saying these are the only homesteading skills you need, nor am I saying you are not a homesteader if you do not know how to do some of these. But I do believe we all should be doing our best to acquire and then pass down these skills; and I’ll share why as well as some resources. The biggest piece of advice I can give you, before we head into the list, is to take on one or two skills at a time. If you try to learn and execute them all at once, you are going to do them poorly and probably burn out. 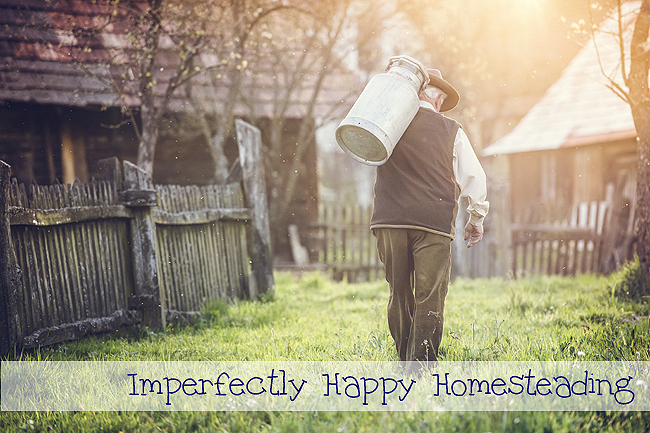 These homesteading skills are not in any particular order – just as they came to my mind. When I say we need to learn to tend animals I mean the full circle. We need to learn to raise them from babies, breed them, keep them healthy naturally, make their feed if necessary, to provide a good life and how to butcher humanely. We should also know how to choose good breeding stock. We should know to milk our dairy animals and how often. Lastly we should know the requirements for those animals because quail, chicken, rabbits, hogs, goats and cows all have very different needs. Even backyard farmers can have livestock! 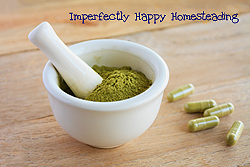 Learn How to Prepare and Use Home Remedies. Long before drug stores and western medicine there were herbs and those who knew how to prepare them for the body. This is a more natural approach to health and healing for you, your family and even your animals. I am not saying you should stop seeing your doctor but you should know how to care for the body when one is not readily available. I recommend signing up for some online herb courses to get you going. See: Medicinal Herbs to Always Have on Hand, How to Make Chill-Out Tea and How to Build a Natural Pharmacy at Home. Long before mega stores were around every corner, we created our own clothing, blankets and other household items with our own 2 hands. We also put buttons back on, darned socks and repaired clothing instead of tossing it. These are not only practical skills but ones that can create special keepsakes as well. And hey, if I want a closet full of chicken print dresses I can darn well make them! So learn to read and make patterns, sew, knit a blanket or some socks, crochet a wash cloth or a cute beanie and quilt anything you can! Did you know you can learn a lot of Vintage Skills on YouTube? I’m assuming most of you were expecting this to be on the list. If we are going to grow and raise food then we absolutely need to know how to preserve it. You should know how to can, dehydrate and store your food for a season or longer. Ok this sort of goes along the lines of cooking from scratch but I felt these two homesteading skills needed their own place on the list. If you are going to have dairy animals you, most likely, won’t be drinking all the milk. You need to learn to make butter and cheeses from your bounty! Did you know you can make butter from goat’s milk too? Waste not, want not. Rendered fat is wonderful for cooking but you can also make soap with it and use it medicinally. And it isn’t hard to render fat. I do recommend you do this with grass fed or pastured raised animals for the healthiest quality. 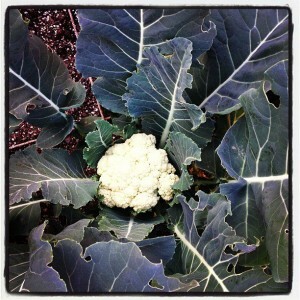 If you’re going to garden organically, you’re going to need compost. This is the black gold of our gardens! Composting isn’t hard but there are a few things to learn before you get started. And if amazing soil wasn’t enough, composting helps you and your homestead produce less waste! Winner! I have several articles to help your composting efforts! Solar cooking may not be high on your skills list but it should be. This is a great way to cook without heating your house up in the summer, reduce your energy costs and how to cook “off-grid”. I use my All-American Sun Oven all the time – it is a workhorse for me in the desert when the last thing I want to do is turn on the oven. Whether you make soap, household cleaners or your own candles, making your own can save you money in the long run. No matter how skilled you are or how much land you have…you can’t do it all! You’ll need to know how to barter for food, items and skills you simply do not have. Bartering to learn skills is another great option. Going back to know how to make your how herbal remedies, you also need to know first aid and CPR. This is especially crucial if you live further out from a city or ambulance service. And don’t learn this just for people, your animals need your too! To be a successful homesteader you’ll need to learn how to do things on your own. Not only if you’re in the country but because homesteading is all about self sufficiency. So learn how to fix things around the house and keep your car and other motorized equipment going. And for the love of DIY do not count on YouTube to show you everything. You need some printed manuals for the home and car. What homesteading skill would you add to my list? Remember it isn’t just about learning these skills but teaching others about them as well. Let us not lose the beautiful art of homesteading! 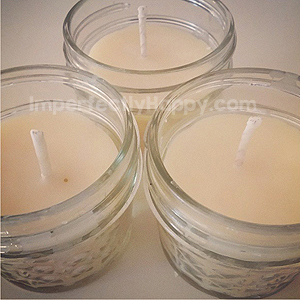 I am excited to try my hand at your candle making recipe now, I love that you use coconut oil in it as well. Thank you for sharing these! I know scratch cooking is on the list but I think making your own bread needs to be mentioned. Thanks for this great list and the links too! I agree, bread from scratch is an important skill. This is perhaps the best list i’ve seen of homesteading skills, but there is always more, isn’t there? I’ve been slowly trying to reduce my groceries to mostly single ingredients, which means i’m making more of the food. 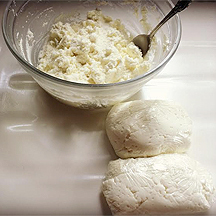 Baking bread from a starter is one of them, but also I make yogurt and i’m starting to make some simple cheeses. In the old days no one did everything, but between you and your neighbors, you’d probably have it all covered. You might not have a cow and be making butter and cheese, but your neighbor is. And they might not have chickens and turkeys, but you do, and another neighbor sheep and is spinning yarn. This is how our complex economy started. In micro-form (or micro-farm, lol) it is so much nicer and more personal. I love the idea of neighbors working together. I can’t say I have seen much of that in this modern time. I also think you have a lot more respect for others and the value of their work when you know what it took to produce a product. Easy come easy go makes the land fill-grow!!! How about adding spinning to the list? Your yarn will have to come from somewhere. Spinning is great but although I’ve done the most primitive method and learned to knit and crochet I can’t imagine making enough yarn and still having time to accomplish a project with it. Lol there is a reason that they said women’s work is never done even though my father taught himself to crochet as a prisoner from what he remembered watching his mother as a child. Wow…that is a lot! My husband and I are leaving the ‘burbs to homestead in our retirement. We have always longed for a simpler life. Our land is wooded. Is your list prioritised in any way? We have chickens. I dabble in canning. Gardening has always been one of my favorite pass times. Very excited about the possibilities. Normally I would just say start with gardening; but sounds like you have that down. It helps to start with you’re most excited and what will work for the time of year and for the area you’re moving to. Just learned some great ways to use your chickens as little “garden labourers” I’ve raised chickens and gardened but never made good use of the birds in the garden but surely have thought of ways since! Great list. Only thing I would like to add is weaving. Baskets, rugs, etc. I need to learn weaving! What a great skill! Gardening has always been my horrible downfall. I have a super black thumb!!! My grandparents gardened and preserved it all, but my parents took the grocery store easy way as most of those raised in the 30’s-40’s did. Who knew it would be the wrong move??? So I never really learned and regret it big time! Carol I used to kill indoor plants all the time. But I found a gardening mentor who has helped me become a successful gardener. I think that generation all moved into the cities for convenience and we lost so many worthwhile skills. You can get your knitting, crochet skills for a leftie by turning the computer screen away from you and using a mirror to reflect the images back to you. Hope it helps. I’d add woodworking, blacksmithing, brewing beer, and distilling spirits. Those last two skills yields very barter-able items. Between my husband and I, we know almost all of those skills with various levels of expertise. We’ve been homesteading for 17 years now, and first lived in an Amish built house with no electricity. Some things we can do really well, (like raising healthy animals), and other things not as well (I can knit a scarf, but not mittens yet). It’s getting easier to find resources and instruction books now that there has been a revival on homesteading and traditional crafts. We used to have to source out books from the ’70’s at second hand book stores. I think that butchering should be added to your list. I enjoyed your list and am happy to say that I do all but maybe one or two of the items. Loved everything I learned from my grandparents (sadly only one set was alive but they were neighbors and I saw them everyday) and my parents, like you maybe I didn’t know I was enjoying the information at the time. Thank you for your list. We’re just getting our website and blog running; stop by if you get a chance, I’d love your comments! Let’s not forget about heating! We don’t have a furnace at all in our house. We heat strictly with 2 wood burning stoves. Not to mention using it for cooking on also. It’s an amazing source of natural heat! If your local or state governments allow, harvesting water is a great skill to add in. Whether it be from a nearby tank, well with a manual pump, or rain water, doing so can be a good first step toward self-sufficiency. After all, water is the most crucial item for survival next to air. Great post! Honestly I think you could add to this list forever because there are endless skills to learn and master as a homesteader, which is part of why I love it so much! It keeps me chaullenged and always learning and growing. Bread-making, fishing, hunting, foraging, using essential oils, making your own toiletries and body products, carpentry, bush skills… The list goes on. I think you came up with all the best ones to start with! Oh I forgot whoever called homesteading and organic farming the simple life has obviously never done it LOL Its the hardest work from sun up to sun down with always more that needs done! BUT the hardest thing I found bout that lifestyle was to schedule in time for play! Time for the kids and alone time for me and my hubby! I’m serious it is a must to learn how to schedule in playtime! It was easier for my husband than me he had like an internal clock and when he got that internal alarm off he went to go play w/ the kids or dogs/ animals 🙂 But for me i failed miserably most of the time! I couldn’t relax knowing more had to be done and there was always more! I would work till exhaustion most nights! Now I really regret the time I should of spent playing!!! This is a fantastic list! Comprehensive but not so much that it feels overwhelming. I was listening to a Podcast last night and it said homesteading was more about a set of skills you had than a specific place to be at… i liked this idea and feel your post also encapsulates it. It is a goal of mine to be a homesteader. I take care of my elderly mom and she tells me about things that they use to do when she was a girl. I write down all the advice she gives and research every chance I get and write what I learn down. I am practicing all the skills when I can and when I can afford to. I have been lucky to find most of my canning items at yard sales and have saved so much money doing that. I have made a list of items that is used in homesteading and am looking for those items at yard sales and thrift store. I have been very lucky with finding all kinds of things. I find making a list of wants for homesteading and needs for homesteading and trying to find the items at yard sales is making my homesteading dream come together a little at a time. I was worried that everything that is needed in homesteading would cost way more than I can afford, but the yard sales has helped. As a family on one income I can only afford to put 10.00 a month on my dream, but sometimes you can find some really great items. Does anyone else have ways that they have saved money creating their homesteading dream? I would teach the home repair skills. Yes you can replace a faucet, or toilet yourself. Yes you can join two boards together, and build a chicken coop. Yes you will make mistakes. Even the masters do.